After a degree in Illustration, Aimee became fascinated by the beauty of stained glass during an internship with a glass studio in Glasgow. 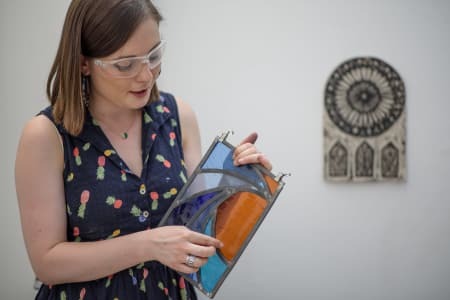 Learning the traditional skills of stained glass (which have remained much the same for hundreds of years), Aimee then completed an MA in Glass Design, and now runs her own stained glass studio in London, making contemporary stained glass panels, windows and sculptures. Glass is an amazing material, and stained glass craft can result in extraordinary designs, from the traditional to the contemporary and from gallery artworks to beautiful additions to the home. The dazzling effects of colour and light are genuinely exciting to work with. Aimee really enjoys teaching, and recently demonstrated her skills for an upcoming BBC TV series on craft and making. Class numbers are deliberately kept small, so that everyone can benefit from bespoke teaching and advice and can leave with real stained glass skills. And of course, the classes are fun! The studio is contemporary and creative, and the emphasis is on having an enjoyable day learning something completely unique! This class was exceptional! I decided to do this class because I had never done anything like it before, and I absolutely loved it. I'm so pleased I decided to do it in the end. I was learning from Aimee, who is clearly an extraordinarily talented artist, in the very studio she works in. The venue was really cool, a huge industrial conversion filled with artists studios of all shaped and sizes. Aimee had very much made it her own, she even had her own little tea and coffee making station. My class was actually a one-on-one, but it wasn't awkward at all, as Aimee herself is really personable and the art is completely all consuming. I went in a complete, disastrous beginner. I knew nothing about stained-glass at all, other than what I'd seen in the odd church here and there. Aimee took the whole thing in her stride, even when I revealed I hadn't pre-planned my design. I wanted to steer away from the chosen colours she'd laid out as well, but she made an effort out find me some extra pieces in different colours and textures, so that I had exactly what I wanted. I really fell in love with the whole thing was when Aimee told me that my stained-glass window would last forever. The thought of having something that I've made, passed on to my kids and grand-kids made me realise the investment was well worth it! I also loved the fact that now, when I see a stained glass window, I'll look at it so much differently, looking at how they composed it. Aimee informed me on some history, she told me all about the commissions she has done and told me a great story about the man she learned the art of stained-glass from in Scotland. She was clearly really passionate about it, and it really rubbed off on me in a way I wasn't expecting! A really brilliant teacher.My finished piece is sat pride of place on my potting shelves outside, it looks glorious and on a sunny day really stands out in my garden! I absolutely love it. Thanks Aimee - and to anyone thinking about going on this class - you have to do it! Aimee is a patient and fun teacher. She is welcoming and makes the first project fun. I really recommend her class for anyone interested in glass. Wonderful experience with this course. It provided a great overview of the process from start to finish. We had the freedom to try any style of design. Aimee was a supportive teacher and clearly showed us each step of the process. At the end of the day we had a beautiful piece of stained glass to take home. I really enjoyed this class. 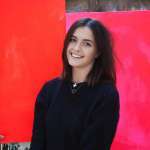 Aimee, the tutor was professional in the way she delivered the course. It was a relaxed and freindly environemnt and having never worked with stained glass I felt that I learned alot within the day and I would highly recommend doing this course with Aimee. Overall it was excellent. I had great fun making my own stained glass panel with Aimee's help. Being quite clumsy when it comes to doing crafty things, I was unsure if I would be able to produce a good-looking piece, but Aimee is very patient and helpful, and I'm super pleased with the result. It was quite an intense day (making stained glass is hard work!) but also very satisfying. I have always wanted to give stained glass a try but never really knew how to give it a go. I loved this class, Aimee was really friendly and encouraging and took us through the steps in a very clear way.She was very supportive and genuinely excited by our first attempts at making something from scratch. We ended up with our own completely individual pieces of stained glass work and a massive sense of accomplishment. Can't recommend it enough, thank you. Aimee McCulloch's stained glass for beginners class was an absolute joy from start to finish! It's an opportunity to work with someone who really knows her stuff and is more than happy to share her knowledge and infectious enthusiasm. She is encouraging and will guide and lend a helping hand where necessary, but she also just lets you run with it as your confidence in the process grows. I had never worked with glass before and I came away from the class with not only a finished object at a standard beyond my expectations, but also really excited and fired up and full of ideas for other designs and the desire to see them realised. 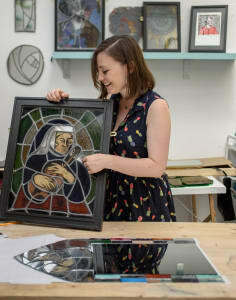 [Now, unfortunately I don't currently have a suitable space to pursue this, but you could definitely work all sorts of stained glass magic on a kitchen table (or other horizontal surface that you can temporarily hammer horseshoe nails into--don't be put off thinking it's too specialised a craft!).] It was a wonderful, very satisfying experience and I recommend Aimee's classes unreservedly. Go for it! I really enjoyed Aimee's Stained Glass for Beginners class. I was lucky enough to be the only student that day and so I got lots of guidance and advice. I got over my fear of cutting glass fairly quickly; I needn't have worried, it was actually rather satisfying to cut pieces to the shape I wanted and by the end of the day I had created a piece that I am quite proud of, considering it was my first attempt. It is bringing joyful colour into my room as I type, even though it's overcast outside. 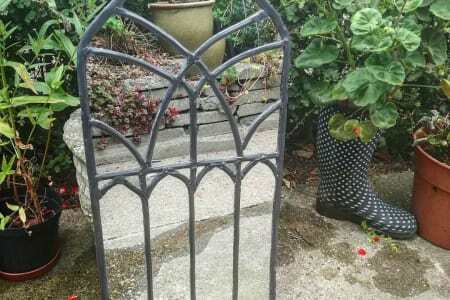 It will be fab when the sun shines again. Thank you Aimee! Aimee was a fantastic teacher! She was really thorough in explaining the process and really knowledgeable as we went through step by step. I really enjoyed the class and am over the moon with my finished product. I would recommend this class to anyone looking to learn something new, and produce a high quality piece of art! This was super interesting and Aimee was a 5 star tutor. She was super knowledgeable and supportive, she encouraged each of us to come up with our own designs and helped each out to produce them. She wend out of her way to go through her scraps and find just the right color and texture of glass as much as she could. I learned a lot and I would recommend the class to anyone! Great host, very accommodating with everyones designs. Generous with time and cups of tea! I completely lucked out with the stained glass course with Aimée. When I arrived she apologised as a couple of people had rearranged for another date so it just left me - basically one to one tuition for the day. This meant we could take on something a little larger and more complex which was brilliant. I had already thought about, although not drawn up, some designs but she had lots of options available anyway. She talked me through all the processes really simply so I was able to feel like I got a grasp of each phase quite quickly and if I needed any help she was happy to step in. She was also lovely to chat to and a situation that could have been quite awkward with just the two of us actually felt like having a day being 'crafty' with a mate. Thoroughly recommend the course and came away with a piece that apparently will last at least 80 years before any restoration work required - amazing.